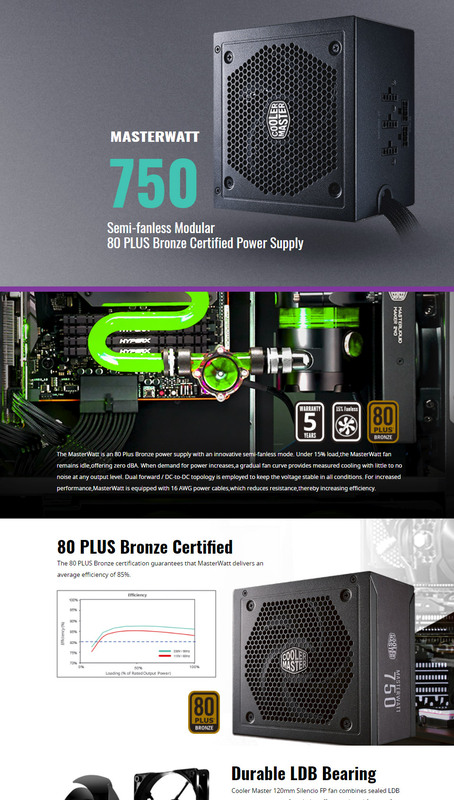 The Cooler Master MasterWatt is an 80 Plus 750W Bronze power supply with an innovative semi-fanless mode. Under 15% load, the MasterWatt fan remains idle, offering zero dBA. When demand for power increases, a gradual fan curve provides measured cooling with little to no noise at any output level. Dual forward / DC-to-DC topology is employed to keep the voltage stable in all conditions. For increased performance, MasterWatt is equipped with 16 AWG power cables, which reduces resistance,thereby increasing efficiency.